Hmmm I just got thirsty...gorgeous shot Sabra! 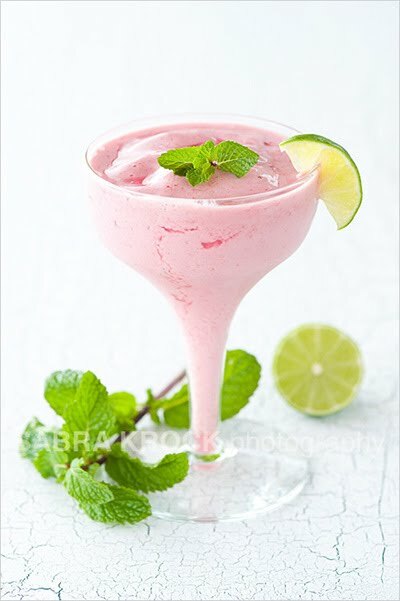 I love protein smoothies, and like you often used agave to sweeten. Now I'm reading that agave is worse that high fructose corn syrup. I now use stevia to sweeten. This was not good news because I had a good amount of recipes posted using raw agave nectar. It can be so confusing. As usual,your photo is stunning, and the lime touch is nice. I read the same thing - but then I read that those sources weren't credible. So for now I'm trying not to over-react and waiting to see ... but it's true agave is processed and processed is never good. I would sooner use raw cane sugar (or honey) - but I do like the low glycemic aspect of agave. I will continue to read and let you know if I see anything definitive. Beautiful color! P.L. loves smoothies for putting on weight and energy-builders. He throws in banana and any syrups in the fridge. He'll love using your fancy blender. In mine, you have to put your feet in and squoosh the fruit a la Lucille Ball. Oh yum homemade smoothies are the best! This looks so refreshing! I love all the ingredients you used!! First time here and I love your blog, Everything looks so fresh and healthy and tasty!